John Street School played Duncanrigg in the semi-finals beating them 7-1, Willie MIller scoring six of the goals. The final was played against Holyrood School the final score being 3-2, Willie Miller hat-trick! December 2009. Photo sent in by Vic Dougherty. "..........hi I am new to your website and found it most interesting. 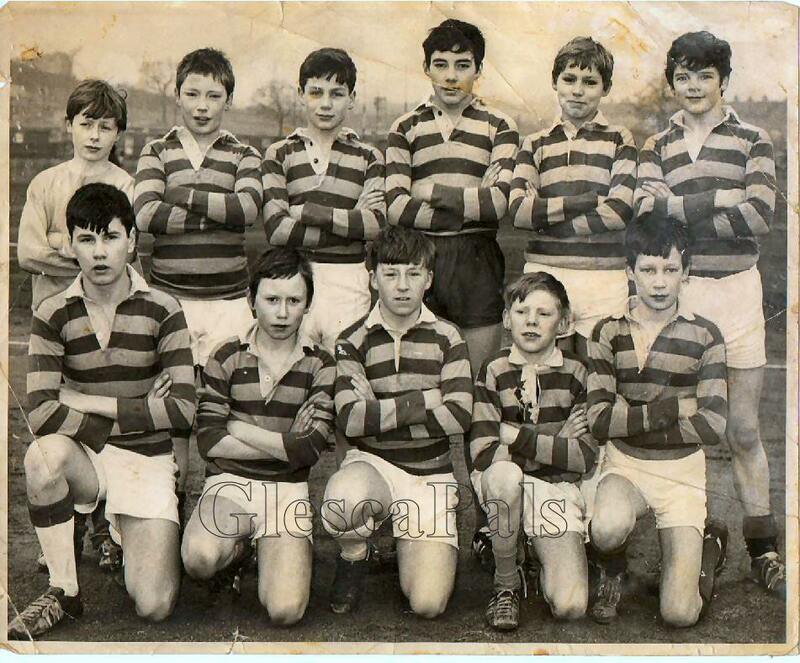 I attach a photo and details from my old school football team. AS I RECALL- FROM LEFT TO RIGHT BACK ROW 1 HUGHIE GALBRAITH 2 DAVE ? 3 DAVE HOWIE 4 WILLIE MILLER went on to play for Aberdeen/Scotland 5 TOMMY BRANNIGAN – Leeds Utd, 6 Me- VICTOR DOUGHERTY- Bury FC FRONT ROW 7 ALLISTAR ? 8 ? 9 ? 10 ? 11 ALISTDAIR ?" remember this era well in fact these guys were the year below me at school and indeed three or four of them came from my old primary school in Brigton, Dalmarnock Primary School. Thanks for sending me the photo Vic. Anyway just thought we would let you know. I dont want my uncle taking credit for winning the cup haha. Hi Webmaister, just read all posts from John St school. Brought back so many memories. Your photograph of 1970 football team were all in my year as well as your sister Linda. For Victor Docherty the boy front row no 5 was Alistair Dougall and not James Wooodburn as they both lived beside me in Forrest Street, Mile End. I was neighbours with your friend Edward Hunter. ... well what an amazing picture John St cup winning team 1970, I saw myself in the front row and now all the boys, i sat next tae wullie miller at school and i was known as big crazy. Great team we beat Duncanrigg 7-1 in the semis and willie miller scored six, In the final we beat Holyrood 3-2 willie scored a hatrick, Tam brannigan gave away a penalty in the final and we were under the cosh a bit. Big willie done the business. Where are all the guys? Hi webmaister long time since I have seen you. Your site is brill. I had another look at meesel kneelin oan ra front row of the 1970 cup winning team. What a team! The memories are nice. I was a member of the 28th glasgow BB. And my boys won the battalion cup at roseberry in the early 70's bobby mcewan from John Street & Bobby Davison from John Street were in the Squad. I attended St james primary at a youngster. what great memories of bridgeton and calton. The old steamy, the pitches pavilion,w here we thought we were it, with oor embracation etc. Also remember St Thomas Church,where I got my 1st set of bagpipes from. How is your sister i was in her class along wi' all the boys. yep a brilliant site. I remember yourself, with the flute, and i used to play the guitar with Big Jim Turnbull how is he?